MCC won comfortably by 71 runs. Oh spring was in the air and I thought that I would wander. It must be spring because it wasn’t snowing but brass monkeys everywhere were talking in very high pitched voices. After the game against Serendib being cancelled last Sunday because of snow at the early morning mass, we had all watched the weather forecast very closely and things were looking good at the first nets of the season on Friday afternoon. So it was off to Züricherstrasse to face the might of CC Bavaria for the first match of the season. It started at around 12°C and rapidly plummeted to something much more comfortable, that is comfortable when we were able to hide in the hut when the hailstorms came. Elder statesman Doug Giles, fresh from the scoring training, turned up and was persuaded to score the second innings allowing me to walk around and probably saved my life. Captain for the Day, Lovell, took the toss without using the correct Maria Teresa silver dollar but was forgiven as he won anyway and chose to bat. He and club vice-captain Palfrey got MCC off to a splendid start bringing the 50 up after 7.5 overs. Palfrey fell for 43 with the score on 65 and new member Amith Sarma replaced him at the crease. Twenty runs later Lovell fell for 16 and was replaced by a determined DiPerna who faced four balls before striking his first six. Sarma and DiPerna built a superb third wicket partnership of 92 before DiPerna was out for 53 off 28 balls including five fours and four sixes. Rabbani came out now and pushed on with Sarma against what was not the best of bowling to make a 123 run fourth wicket partnership before Sarma went for 90 off 83 balls, his 50 coming up off 52 balls. Garner, the big bird, came to the crease for a 15 run partnership with Rabbani who fell for 61 off 48 balls being run out in the 40th over. His 50 had come off 42 balls. Blades now came to the crease for the final four balls and finished not out, MCC having accumulated 316 for 5 in the 40 overs. MCCs bowling attack was opened by Hobbs and new member Manohar Jonnolegadda, henceforth to be known as battleship, who confessed afterwards that he had never before played with a new ball. Nevertheless he had looked useful at the Friday nets and finished with 2 – 50 off 6.2.overs. For the first four overs CCB were ahead of the rate scoring 34 runs but had already lost their first wicket to the guile of Hobbs. Their wickets fell regularly, the highest partnership being 54 for the 8th wicket and their run rate stayed around six runs per over which was well below the asking rate. Battleship was very keen and fast in the field and one is left to admire the fitness of youth again, although, remembering young Brendan Dunne perhaps youth and fitness do not necessarily go together. Igor Sestan our only Croatian member playing the first game of cricket in his life was also very keen and active in the field as was Dean Robinson despite falling from a six foot ladder on Saturday and hurting his shoulder – that reminds me of a story for the end of season awards party. Two splendid catches should be mentioned, Lovell with a ground-shattering, diving catch in the slips and Rabbani with an instinctive effort at mid-on, the ball having been struck by the CCB dangerman McIntosh and coming at him like a rocket. Bunty Blades savoured the first Michelle of his career and has only a hattrick and 300 accumulated wickets to aim for now. 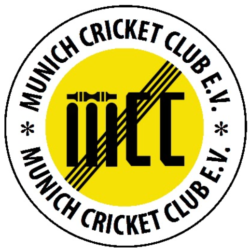 CC Bavaria were all out for 245 in 37.2 overs giving MCC a 71 run victory. Blades. Record wkt taker with first ever Michelle. In a low scoring friendly Sobek top scored with 37 with Sear the pick of the bowlers. MCC won convincingly by 117 runs. 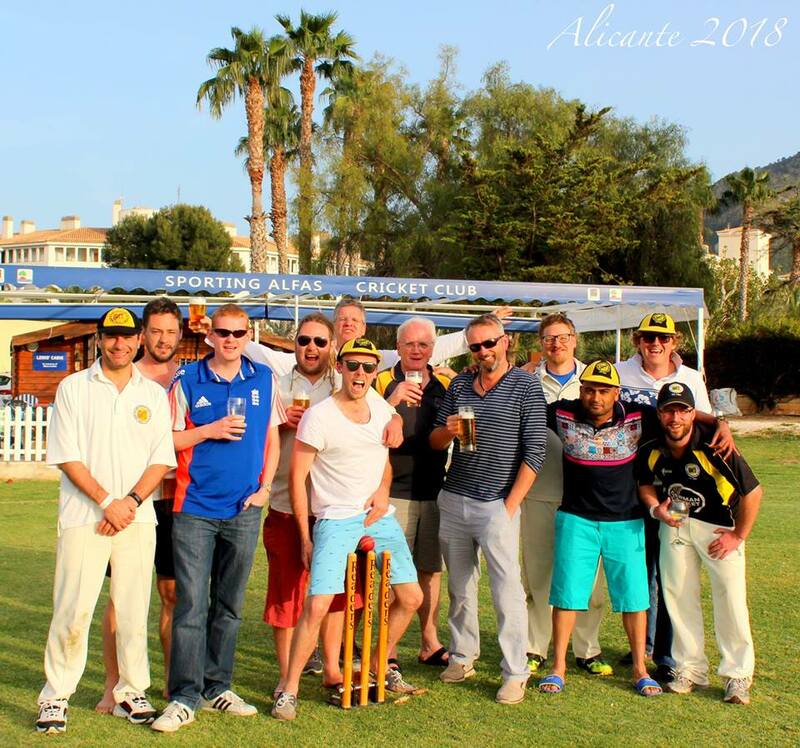 MCC welcomed former golden gloves Edward Dean and his tourists to the Hirschanger. The tourists ranks were bolstered by Maygar and Gale. Mcc posted an imposing total with Lovell top scoring and Algar also notching a half-century. The wickets were shared about with Manohar the pick. A pleasant evening of frolics followed in the tower hiding from the inevitable late evening thunderstorm. Lovell 5000 runs fast approaching. Newboy Ferguson (24) and Lovell (81) put on 96 for the first wicket to put MCC in control during a fast start..ultimately totalling 205 all out in 29 overs. German champions Pak Orient lost wkts at regular interval with Notts finest Finch & Fudge taking three each. Ferguson bowled with fire but without luck. Some keen fielding and good catches paved the way for a deserved MCC win. On a hot day in Zuricherstrasse MCC played a T20 Friendly. Fudge, Ferguson and Aamruth all provided useful contributions with new Kiwi Brent Goldsack top scoring with 37 as MCC totalled 147 on this high scoring postage stamp ground. The home side struggled in reply with Wilson, Maygar and the Fudge picking up wickets but MCC were finally seen off by 4 wkts. Another stinking hot day in Johasenbergl with MCC taking on POCC in a t25 friendly. Ferguson was the pick of the bowlers with Koch also picking up 2 wickets. In reply Sarma top scored with 45 at the top of the order with Ferguson not out on 15 and Aamruth the only double figurer on 11 as MCC subsided to 113 all out. Ferguson – all round contribution. MCC won by 2 runs. A slightly ‘short’ MCC side bolstered by 2 SSC stalwarts were involved in a highly entertaining affair in Perlach. Mcc recoverd from 19-5 to post 131 in their allocation on a particularly long outfield. Lovell top scored sharing in 50 partnerships with Manohar and Anthony. In reply SSC were coasting before former MCC player Winsley got to work dismantling the SSC top order. Aided by some keen fielding and better bowling from Aamruth, Manohar and skipper Brent G MCC pulled off a ‘tight’ victory against all odds.